You know when a market's hotting up when the leading specialists start getting plucked by the top tier, and Accenture today made a massive $375m statement of intent in the procurement and supply chain management BPO industry by acquiring the darling of niche sourcing specialists, Procurian. Today's acquisition of Procurian both reinforces Accenture's market leading position in procurement and sourcing and significantly alters the competitive landscape. In our July 2013, Blueprint for Procurement Outsourcing Services both Accenture (#1, 19.4% market share) and Procurian (#5, 8.9%) were in our “Winner’s Circle” of service providers, hence the merger between these two Procurement Outsourcing leaders creates a clear procurement BPO market leader in terms of market share, client base, vertical industry expertise and breadth of service offerings across the procurement and supplier management domains. 1) Strengthens Accenture’s Leading Position in Procurement Outsourcing. Accenture was one of the early entrants in the Procurement Outsourcing market and over the years has built a market leading position by providing both sourcing and transactional procurement services. Just three years ago, Accenture purchased Ariba’s strategic sourcing practice for $51 million in order to add breadth and depth to its sourcing and category management capabilities especially in direct materials and coverage of manufacturing industries. This acquisition which really is a “double down” investment in sourcing, including ~800 FTEs to add further depth and coverage of some direct materials categories and a broad reference base of clients in consumer goods from which Accenture benefits . We also believe that Accenture will be able to leverage the acquisition to encourage further integration between its BPO, Management Consulting and Technology capabilities for Procurement which increasingly go-to-market together as Accenture Sourcing and Procurement Business Services. 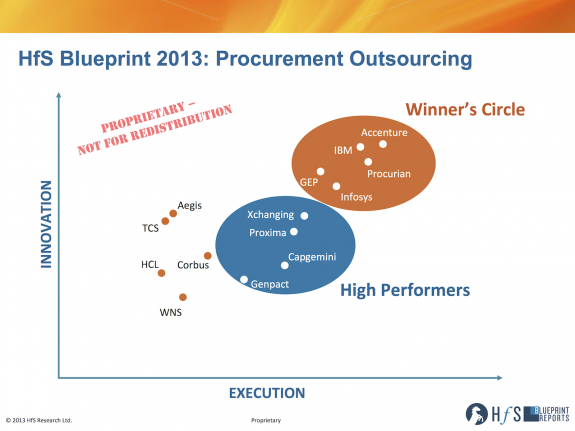 Many HfS clients are looking for procurement transformation capabilities from providers, often before considering a BPO engagement and the merged Accenture/Procurian service offers this in spades. 2) Removes a significant independent service provider and undermines Genpact’s and Capgemini’s procurement strategies. Where Procurian has been a sourcing partner to other BPO Service Providers such as Genpact and Capgemini in the last few years, with Accenture it has been a head-to-head competitor – for example winning its landmark Kimberly Clark procurement engagement against Accenture in 2006. Acquiring Procurian therefore takes out a direct competitor for Accenture (especially in strategic sourcing services) and also undermines the procurement positioning of Genpact, which will most likely need to look to either organically to build up its own sourcing depth quickly, or may look to acquire one of the other remaining stand-alone sourcing and procurement service providers. Capgemini was also working in partnership with Procurian, where the two firms enjoyed a recent procurement BPO contract win with US chemical manufacturer Ferro, and may need to seek a niche acquisition in the market to supports its IBX platform and growing supply chain BPO business. 3) Provides a broader technology suite for Accenture. One of Accenture’s strengths (and challenges) has been its technology agnostic approach to solutioning procurement engagements. We like this acquisition because it brings Procurian’s various proprietary tools and applications for procurement over to Accenture. As we identified recently when assessing Xchanging’s acquisition of MarketMaker4, the market is placing greater importance now on service provider technology in procurement and this acquisition marks a significant evolutions in Accenture’s procurement and sourcing toolset with additions such as SavingsLinkTM allowing for the measurement, analysis and tracking of forecasted and realized enterprise savings. 4) Brings greater scale to recent Procurian acquisitions. Procurian had been an active acquirer in the last year or so, purchasing MediaIQ for capabilities in media audits and Utilities Analyses to manage energy costs. Both of capabilities will benefit from having access to the greater breath of Accenture’s client base post the transaction close. 5) Adds significant depth to Accenture’s broad finance and procurement multi-tower capability. At HfS, we are increasingly seeing procurement transformation and BPO engagements being initiated by finance leaders already experienced with the trials and tribulations of finance and accounting BPO – a more mature and developed market globally. With Accenture’s considerable scale and depth in F&A BPO, adding the additional technology and sourcing acumen brought by Procurian provides a tremendous compliment – and upsell potential - to Accenture’s F&A BPO clients. 6) Moves another step towards Mike Salvino’s 6th Generation BPO vision for Procurement. Previously, HfS Research had interviewed Accenture BPO Growth Platform CEO, Mike Salvino and shared his framework for the generations of BPO. That framework ended with a future 6th Generation which is built around the concept of “community”. We believe that by acquiring Procurian’s strong client community development program and deliverables and adding it to what has continued from the Ariba acquisition, this vision for a “community” of procurement BPO specifically is much closer to becoming real. We have been increasingly impressed with the thought leadership focus and benchmarking prowess Procurian has delivered to its client community, especially in recent years. Accenture needs to embrace this capability and integrate the Procurian community into its own BPO community. At HfS Research, we believe that technology is becoming a real differentiator in the Procurement Business Process Outsourcing market. From analytics to platforms to dashboards, the exposure to - and adoption of - IT Procurement offerings are changing the market landscape, and one of things that we will watch most carefully from this acquisition is the degree to which the Procurian technology suite becomes integrated into the core of Accenture’s offerings and becomes part of a simplified technology roadmap over time. We will also want to watch how the other leading Procurement BPO service providers respond to this acquisition, with regards to how they try to match the breadth of sourcing expertise this creates, and how they respond to the changing technology landscape as well. Procurement and Sourcing specialist providers, such as GEP (Global eProcure), Proxima, Denali and even, potentially, Xchanging, now come into play as potential acquisition targets for the Tier 1 BPOs seeking further sourcing and technology depth and expertise. Most acquisitions in the services world result in some degree of client defections after the event, and with several Procurian clients having come from partnerships with other service providers such as Genpact, we will be anxious to see if they stay with Accenture - and how Genpact and others respond. Similarly, will the SMB clients that Procurian has developed find a home in Accenture both as procurement clients but also as potential buyers of other BPO offerings as well? Clearly, both merging parties feel comfortable that the exiting clientele will stay loyal with the merged entity and additional BPO services added over time, or they wouldn't have ventured into this arrangement. We will also be interested in what happens organizationally during the post-merger integration, to see where the procurement leadership team is itself sourced. How will the strong Procurian leadership team of today be integrated with the retained Ariba team as well as procurement specialists from Management Consulting and Technology? Accenture has a decent track record of develop executives who arrive via acquisition, and clearly the Procurian leadership team feels more comfortable with Accenture as their suitor, as opposed to other potential providers, which were also interested in the firm. Finally, we will be observing whether the stellar efforts Procurian has made over the last several years to create its cherished community of clients will be nurtured and well-managed post-merger and used to launch Salvino's much-vaunted Sixth Generation BPO ecosystem. This is clearly newer turf for Accenture and it'll be interesting to see how the community evolves in a broader client environment. In any event, this is a momentous transaction in the history of Procurement Outsourcing which will have major ripple effects across all the other service providers and likely re-shaping our “Winner’s Circle” for 2014, as a result of Salvino’s decision to double-down on sourcing. 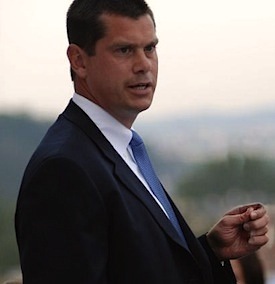 Michael J Salvino (pictured above) is is group chief executive of Accenture Business Process Outsourcing (BPO). You can access his bio here. The HfS Point of View of the merger, authored by Charles Sutherland and Phil Fersht, can be downloaded here.